I received a wonderful package from Judy. You might be able to guess what is hiding under the bow. 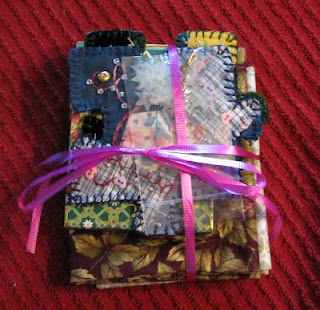 Of course on top is a baggie with some goodies, star sequins and a really cute scissor charm (actually looks like a bird). Then, well, I guess I really need to show you the beautiful puzzle pieces we exchanged. I adore the fabrics Judy chose. 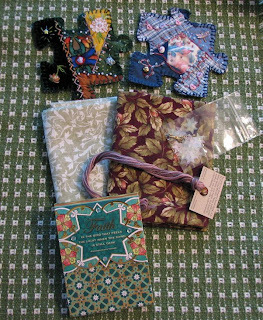 Also two lovely fat quarters, matching thread and a cute notepad that reads: FAITH, is the bird that feels the light when the dawn is still dark. LOVE the puzzle pieces. 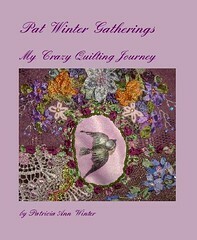 First time I saw them was on Pat Winters blog and I so want to try making some. Have you made any cq puzzle pieces? Do you have photos of them? So glad you like the puzzle pieces, and you know I LOVED yours! I forgot to tell you that the blue piece is from quilt scraps gifted to me by my 80-something aunt when we visited in June. She is such a talented gal, and that quilt was all handpieced. I feel lucky to have her leftovers! And she's the one who introduced me to CQ with a lovely quilt made from my uncle's ties. You won my blog giveaway! !